"A less-dense and wonderfully moist carrot cake with canned mandarin oranges rather than pineapple. A friend shared the recipe with me and I made it to celebrate the birth of my son (a birthday cake). It tastes best if you let it sit in the refrigerator overnight." Preheat oven to 350 degrees F (175 degrees C). Grease a 9x13x2-inch baking dish. Whisk flour, sugar, baking soda, ground cinnamon, salt, and nutmeg together in a bowl. Beat carrots, mandarin oranges, oil, eggs, vanilla extract, and orange zest into flour mixture with an electric mixer until batter is smooth, about 2 minutes. Pour batter into prepared baking dish. Bake in the preheated oven until a toothpick inserted into the center of the cake comes out clean, 40 to 50 minutes. 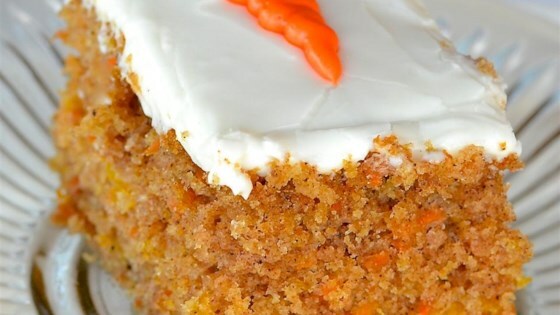 Make this sinfully rich carrot cake--and sit back and enjoy the compliments. I’m wondering about the frosting. This turned out awesome love it! !